Founded in 1703 by Claude Poullart des Places, a native of France, the Congregation of the Holy Spirit (Spiritans) consists of nearly 3,000 members. Spiritan missions can be found in more than 60 countries worldwide, dedicated to working with the poor and championing the needs of the disadvantaged marginalized around the world. Spiritans are rooted in the missionary spirit of their founders, most notably Claude Poullart des Places and Francis Libermann, who is considered the Congregation’s second founder and who merged his missionary zeal with the Spiritans in 1848. From the first Spiritan who served in Baltimore in 1794 to today, Spiritans have a rich history of working in communities in the United States where the need is greatest. Today, there are approximately 90 Spiritan priests and brothers working parishes from California to New York (including own St. Mary’s-Greektown in Detroit), in various educational works, such as Duquesne University and Holy Ghost Preparatory School, and in different justice and peace ministries at the service of the poor. American-born Spiritans are working in many international missions of the Congregation, including Tanzania, Vietnam, South Africa, Mexico, the Philippines and the Dominican Republic. Another 50 Spiritans, mostly from Africa and Ireland, work and study in the U.S. Whether speaking out in pastoral leadership, educating our youth, advocating for social justice, or shepherding parish communities, the Spiritans are involved in the important work of evangelization. Pomotion of justice and peace for the oppressed. 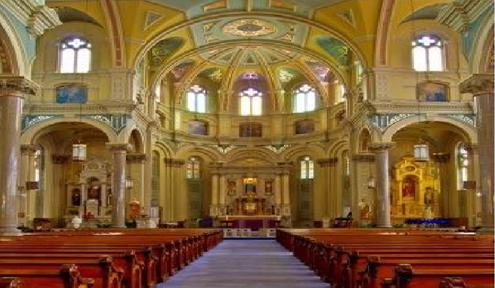 Since 1893, the Holy Ghost Fathers (Spiritans) have faithfully served Old St. Mary’s Church. The Spiritan Fathers continue to exercise their rule of Faith in the Detroit area by making themselves advocates, supporters, and defenders of the weak. Our parish community, friends and visitors are grateful for their dedication to their ministry. Our sister parish is St. Michaels in Tanzania. Fr. Francis W. Schwab C. S. Sp was the first Spiritan Pastor in 1893, followed by Frs. Charles Gruenewald C.S.Sp., Jospeh Wuest C.S.Sp., Frederick Hoeger C.S.Sp., Edward Knaebel C.S.Sp., Francis Haas C.S.Sp., Henry Thiefels C.S.Sp., John E. Nader C.S.Sp., Norman G. Hannahs C.S.Sp., Martin J. Conroy C.S.Sp., Edward J Vilkauskas C.S.Sp., Simon Lobon C.S.Sp. and our current pastor, Fr. Wayne Epperley C.S.Sp. All of these priest and their associates have faithfully served Old St. Mary’s and our community and are an integral part of our parish family.